In his recent article, a custom home builder in Santa Barbara, Doug Ford of DD Ford Construction Inc., highlights the latest trend in home energy solutions, geothermal heating and cooling systems. The technology has gained popularity as homeowners are becoming more aware of their homes' impact on the environment. Geothermal systems use the temperature of the earth 8 ft below ground to regulate the temperature of the air that is distributed through the home's central air system. The temperature of the earth fluctuates far less than the temperature of the outside air, allowing a comfortable temperature to be reached using less fossil fuels than conventional heating and cooling systems. Also, geothermal systems emit no greenhouse gases, which have been linked to global warming. Your inner economist will appreciate another benefit of the new technology, the investment return on geothermal system installation. Geothermal systems have been shown to cut monthly energy usage by half, and as an incentive the Federal Government is offering a 30% tax credit on the cost and installation of geothermal systems through the year 2016. Cities across California, including Montecito, are doing their best to reduce their carbon footprint. 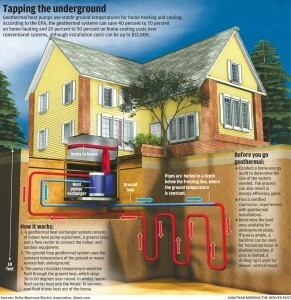 Geothermal energy is a trending way to accomplish this goal while saving homeowners money on their monthly energy bill. Riskin Associates, like DD Ford Construction Inc., wants to know, is geothermal energy in your future?